We are aware that Reaxys links on the abstract (document details) pages in Scopus are currently disabled. We are working to identify the problem and expect to have these links fixed as soon as possible, likely within the next few weeks. All other links are working as expected. Our sincere apologies for any inconvenience this may cause you. As soon as we have the Reaxys links restored, we will post a notice on this blog. Please also follow us on Twitter@scopus for regular news and updates. Since our last content update in June, we’ve been busy moving the Scopus Books Expansion project along. 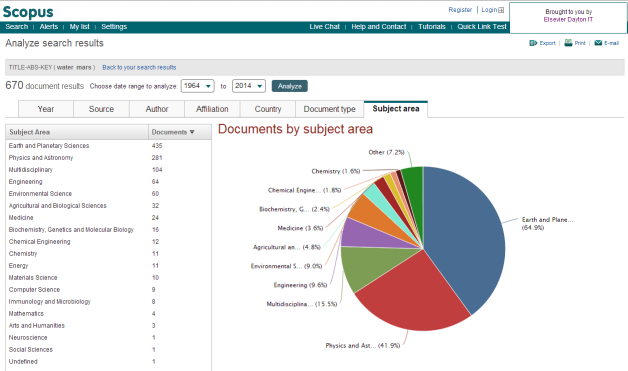 To date, you can see more than 50,000 books in Scopus! In case you missed the announcement, in mid-2013 Scopus launched the Books Expansion Project. Books from more than 30 major publishers such as Springer, Wiley-Blackwell, Elsevier, Brill, Walter de Gruyter, Princeton University Press, Oxford University Press, Cambridge University Press, Taylor & Francis, Palgrave Macmillan and Project Muse have been selected and are being processed for inclusion in Scopus. Although books from all subject fields are considered for the project, the focus is on Social Sciences and Arts & Humanities -- at least 25% of the books currently in Scopus are in these subject fields. Starting September 15, Scopus will test a method of selective internet routing to speed up delivery of our pages to customers. Most customers will see an improvement in speed. However, some customers with unusual internet configurations may experience a problem. If you are suddenly unable to access Scopus as before, this may be due to incompatibility with the new routing method. If you suddenly lose access to Scopus, please first check that the above is indeed the reason for the problem by trying the following URL: www2.scopus.com. This should give you direct access to the original Scopus IP address as before the test. If you now have access again, then you will need to follow the steps below to restore normal service. While we help you fix the problem, your users can continue to use Scopus via a workaround using www2.scopus.com. This may occasionally require them to change the URL – adding a 2 after www – for some links. Since launching a more streamlined interface in February, the Scopus Team has been working on additional site developments that include enhancing Scopus analysis tools as well as improving ORCID functionality. Taking a close look at the Scopus analysis tools, the team made some changes that better support day-to-day research tasks. As a result all analysis tools have been redesigned to provide a more consistent experience across Scopus. Specifically, these 3 tools have been improved and renamed and now include new features such as the option to export charts and graphs. As of September 6, Scopus is discontinuing its support for Internet Explorer 7 (IE7). This means that users currently using IE 7 or any previous versions of Internet Explorer will no longer be able to access Scopus.com after this date. For the purpose of providing an optimal user experience and maintaining platform performance, Scopus is discontinuing the support of older browsers which do not support the new functionalities in the upcoming September 6 release. This decision is also in line with Microsoft ceasing its support for Windows XP and IE7 per April 2014. In order for our users to continue benefitting from Scopus’ new features and functionalities, we recommend that you upgrade your browser to IE 8 or higher or use Google Chrome or Firefox browsers. When evaluating the performance of a journal (or an article or individual researcher), we believe that the research community benefits from having access to a broad range of metrics to better understand performance – it's impossible for one metric to serve all the necessary purposes. Since 2010 Scopus has offered two journal metrics – the Source Normalized Impact per Paper (SNIP) and the SCImago Journal Rank (SJR) – via the Journal Analyzer functionality in Scopus. 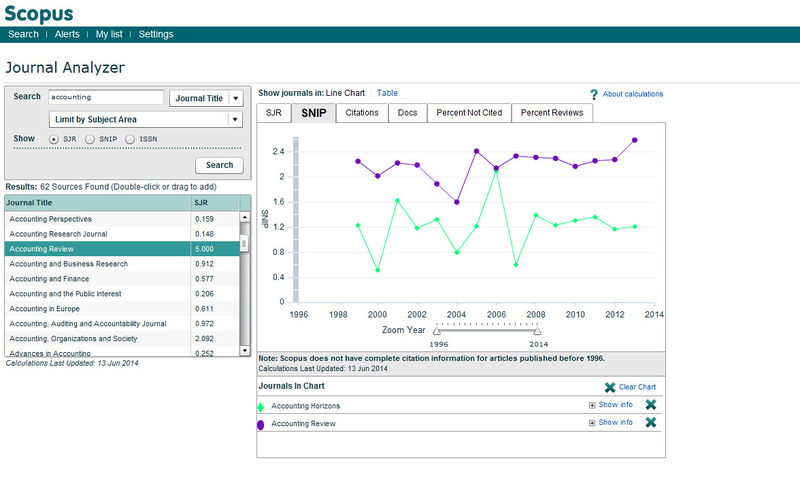 The Journal Analyzer allows you to select up to 10 journals for comparison; the results are uploaded into graphs, making it easy to see how journals perform relative to each other. Additionally the SNIP, SJR and now IPP (Impact per Publication) values can also be viewed per journal in the publicly available title list or via the 'Browse sources' tab in Scopus (only SNIP and SJR are currently in the Scopus interface). An updated version of this post is now available, with new lists and information to verify what is indexed in Scopus. Click this link to read the updated post. Publication malpractice is an unfortunate occurrence in the world of scholarly literature. It happens in all subject areas and in all jurisdictions and few journals or books are immune. Here at Scopus, we have recently received notification of journals that purport to be indexed by Scopus but really are not. These journals have even gone as far as to forge letters from the Head of Scopus Content (signature and all)! And just because a journal may have a Scopus logo on their web site, this does not mean they’re indexed in Scopus. As an author, if you would like to know if your published article will be included in Scopus, we urge you to take note of the following before submitting your work to a journal or conference.